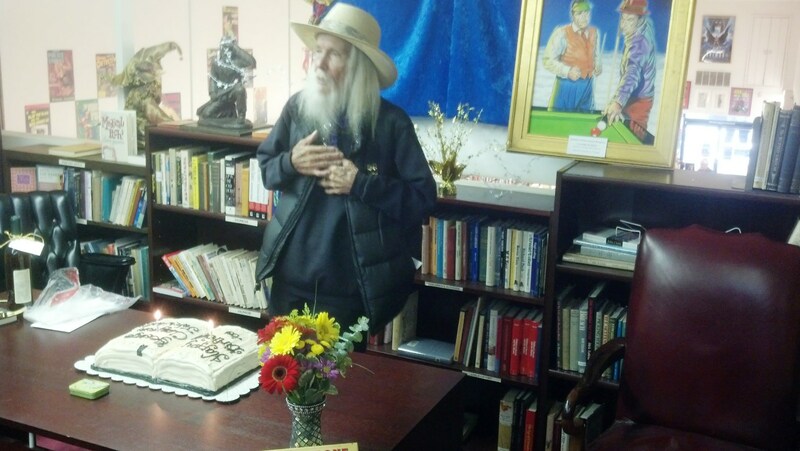 George pontificating instead of blowing out the candles. Photo by John King Tarpinian. George blowing out the candles. Photo by John King Tarpinian. 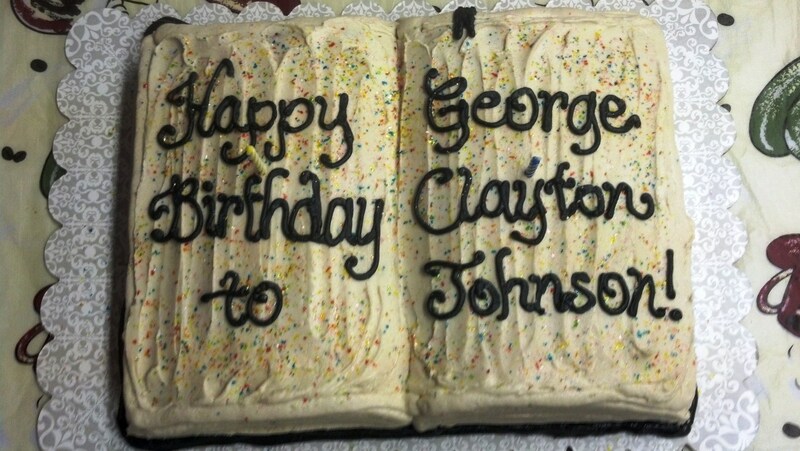 By John King Tarpinian: This afternoon the bookshop, Mystery and Imagination in Glendale, CA held what is now an annual event, George Clayton Johnson’s public birthday party. 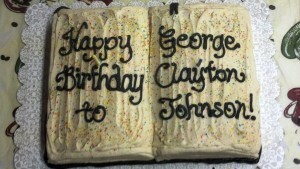 George turned 84 on July 10. George is best known for having written Twilight Zone episodes, the first ever aired Star Trek, the original Ocean’s Eleven and, with William F. Nolan, the cult classic Logan’s Run. Many do not know that he co-wrote the Oscan nominated short subject Icarus Montgolfier Wright with Ray Bradbury. There were about 50 people in attendance, old friends and new, among them Marc Scott Zicree and Dennis Etchison. George spent about an hour talking about his life and loves. Local artist L.J. 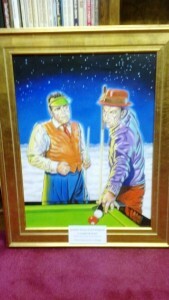 Dopp presented Ray a lovely painting taken from one of George’s best known TZ episodes, A Game of Pool which starred Jonathan Winters and Jack Klugman. L.J. also read a lovely poem he had written about George’s life. Many other gifts were presented along with many words of praise. We started around 2:00 p.m. and ended after 6:00 p.m. when everybody was talked out and all the cake was gone. The cake. Photo by John King Tarpinian. L. J. Dopp’s gift to George. Photo by John King Tarpinian. This entry was posted in Like Show Business and tagged George Clayton Johnson, John King Tarpinian, Mystery & Imagination Bookshop, Ray Bradbury by Mike Glyer. Bookmark the permalink. 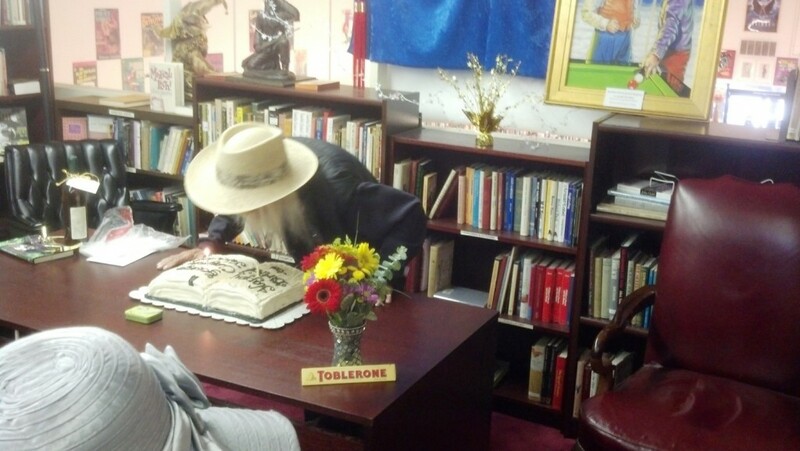 I should add that the cake is in the shape of an open book.